Today Darlene over at Time Warp Women was writing about her brother in law. Here is a little of what she said . . . This is only part of what she was writing about how 'sweet' her bil is to her sister. The first thing that popped into my mind was 'Wow. I wish my Cowboy was that romantic!' To me much of what she described was romantic. But Darlene described it this way . . .
Wow valor and strength. The heart of a servant...the heart of a servant, which we see in the life of Jesus Christ. For me just having my Cowboy do nice things for me just makes me happy and makes me feel good. Last the last two mornings when he made the bed. But it is really about more than just how it makes me feel. It's about . . . It's also about our men raising our sons. And grandsons. It is about us teaching the younger generation. I look around at the younger women I come in contact with and the ideas and attitudes that they have about relationships and dating. Ideas and attitudes about how they are treated by men. One term used way too often now a days 'Baby Daddy' or 'Baby Mama' just really causes me to stop and think. Not only about these young people but these children. The children that are being raised without the knowledge of Valor and Strength. And the knowledge of having a Servant Heart. A heart for Jesus. Maybe you don't come across young people in your circle of friends, co-workers or acquaintances that live in the kind of life style I am talking about. Maybe this is just something you hear about or see in movies. But the fact of the matter is it is out there and it is really true. It really is sad that young men today don't know about Valor. And that young women today don't know what it is like to be treated with respect. Today I was wondering if maybe you would pray for all the younger women out there. All the young girls that are searching for love and acceptance. And pray for the young men that they will strive to become Men of Valor and Strength. Men after God's heart. Darlene has a lot more to say on the subject and she has a linky going on so go over and check out her post today. Click here. Did you know that the word afraid appears 35 times in the New Testament. And that the word fear appears 83 times. And that each time either word is mentioned it is connected with the words 'do not' . Just reading these lines kind of makes me think of a trivia game. But reading this book wasn't like learning trivia. The author says it is 'like a shovel to help you dig deeper, or a light to help you see better.' (page 11). There really are 100 words described and discussed. Some words are: afraid, annoint, cross, friend and many more. The author took great care in studying the original Greek, Hebrew and Aramaic words. As well as studying the historical and cultural contexts to provide the reader with lots of detail and information. Included in the book is an Appendix of Helpful Websites and a Greek word index. Words matter. God cares about them and so should we. Going a little deeper into the Bible's words can make an old passage new again, enriching your understanding of God's message to his children. Why was this word chosen rather than that one? What does it imply in its original language that you can't see in English? And without knowing Greek, how can you learn to explore the details of God's Word for yourself? 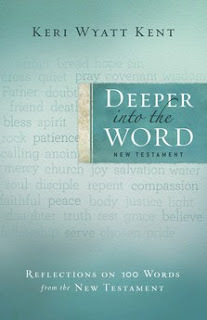 Keri Wyatt Kent provides a fresh encounter with the most important words of the New Testament. Deeper Into the Word can be used as a daily devotional or as an easy-to-use reference tool. Either way, you'll find yourself excited by the wonders of God's amazing Word. To purchase from the publisher click here. Or you can purchase at Amazon. Click here. I really enjoyed this book. It is a great study tool. But it is also just fun to sit and read it or it would be great for a daily devotional. I think it is simple enough to read for an older child or teenager as well as an adult. It would make a great gift too. I received this book from Bethany House as part of thier blogger review program. The FCC rules have been followed. I was not asked to write a positive review. I know you'll agree...this book is pretty. The cover is speaks spring to me. It doesn't stop at the cover the pages are actually pretty. Because it is so pretty I would have to recommend this book as a gift. But wait...it is much more than just pretty. It is is a heart to heart talk with God . 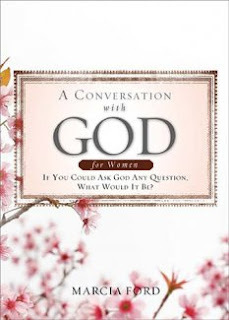 . .
A Conversation with God for Women was created because your heart longs to know, "Why God?" It's time now to find the answers you've been seeking about the past, the present and the future. The answers to 55 of life's greatest questions come straight from the Bible, written in the form of engaging conversations with God, Jesus, and Bible women who offer a female perspective how God especially impacts the lives of women. A question to God: How are we made in your image? A question to Jesus: Did you experience human emotions on earth? A question about the Bible: Did all the miracles really happen? A question about Life: Jesus, What does following you involve? A question about Prayer: Do you hear everybody's prayers? A question about Relationships? What's so bad about gossip? A question about Good and Evil? Are all sins the same with you? I liked the way the book was put together. Each chapter begins with a scripture. Then it begins with a topic or statement followed by specific questions. The answers are written as if God is actually having a conversation with the reader. There isn't a lot of specific scripture mentioned during the dialogue but there are footnotes that take you to the notes section at the end of the book. The notes support the text with the approprite scripture. There are 55 different questions covered in 257 pages. Followed by over 50 pages of notes. I would recommend this book for anyone. I plan to use it is a Bible study guide for the youth that I work with. Men and women alike would enjoy this book. The men will just have to overlook how pretty it is! One other thing that got my attention about the book. And I wanted to commend the publicist and the authors choice not include endorsements. It was refreshing to read a book that is able to stand on it's own with other peoples endorsements. I checked to see where it is available. You can purchase on-line at Amazon, Target. and at a new place I haven't heard of Deep Discount (dot) com. This book was provided to me for review by Booksneeze. I was not required to write a positive review. My list is long is yours? But, today I am just focusing being Happy and Thankful that I am able to post now and apparently able to upload photo's. I have been trying to make the rounds; visiting my blogging friends the last couple of days. And I promise you all if you follow me and you have a link for me to find you I am going to visit you over the next few days. I am prayerful that it is totally resolved finally. So, that's why I am thankful today. How about You? opp's before I go thought I would share this. I found it over at Alicia's check this out . . .
o.k. today I am 'out foxing' the dsl server that refuses to let me download photo's. So what I did was go to my archives and chose the WFW post that had the most comments. And amazing it was my favorite. o.k. so your wonder which one? Well you'll have to click Here. Loved this one. 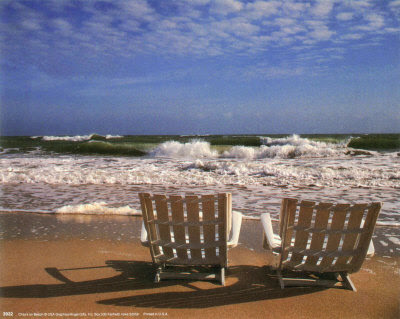 I hope you enjoy today. BTW I have done some visiting and found a couple of new blogs to share and a couple of posted I really enjoyed. a cowboy sticking close to the Man of Galilee. and keep them all for Jesus in the Holy Ghost Corral. I'll work for Jesus all my days. I'll help to round up all the strays! The song "A Cowboy For Jesus" was written by Ira Stanphill in 1948. Found over at Sheltering Tree...click here for the link. I was excited to be offered this great book from B&B media. Jesus In The Presesnt Tense The I Am Statements of Christ by Warren W. Wiersbe is a great study book. Here's an endorsement from the back . . .
" Who Jesus Christ is really matters, now and for eternity. Warren Wiersbe brittalnly explores the great I Am-ness of Jesus. It's good to know who Christ is." Palmer Chinchen , PHD, speaker and author of True Religion and God Can't Sleep. I was struck by the title. I think for me sometimes that I forget that Jesus is in the present. This book did a great job of reminding me. Each Chapter begins with scripture and continues on with each topic backuped with passages and sections of The Word. This was a simple read for me. And I think would be a great study for anyone wanting to grow deeper. Link for the book at Amazon click here. And the information from David C. Cook . . . In Jesus in the Present Tense, Dr. Warren W. Wiersbe explores the "I AM" statements of God-from His burning bush conversation with Moses, to His powerful reassurances to the Israelites, to Jesus's startling claim to be the Light of the World. Many Christians find themselves mired in past regrets or future fears, but the name of God itself reminds readers that God wants them to live in the present. The more readers understand and apply God's I AM statements from the Old and New Testaments, the more they will realize God's peace and joy. Then they will be free to live, serve, and know God more richly in the present tense-which is just where He wants them to be. You can order directing from the publisher . . .
Want more info? Here's another review and the first chapter. Click here. This book was provided for review by B and B Media. I was not asked to write a positive to review and I have followed Trade rules. ...I know I am sorry it sounds a little anonmyous doesn't it. But after trying repeated yesterday and today to upload photo's I give up. But I do have a precious word from God to share with you. And maybe as you read you can close your eyes and drink in His Glory and His Magesty and pretend there are pretty photo's here. I hope that even though I can't add any photo's that at least I can share a few words of encouragement. Today in our morning study I read these words . . . I don't know about you but today I am looking for peace. Peace from the crazy wind. I keep telling Daisy (my dog) they lied when we moved to N. I think it is Kansas. And, we even had a dog show up on the porch yesterday morning! I had to tell Daisy over and over it wasn't Toto! http://www.Hopeinnchrist.org. Isn't that the coolest name? Hope Inn Christ is an aftercare home for boys leaving incarceration. Right there are two boys but next week our third will arrive and then in a couple of weeks a couple more. We will have 7 by summer! Hope Inn Christ is a beautiful 17 acre property that used be a horse ranch years ago (dang it) but there are still some bare bones and in the next few months we'll have fences repaired and horses will be coming. But for now we are all just getting used to living, working, praying, learning and studying together. I wrote on facebook a couple of days ago it is like living at church camp. I think it is the single best experience that I have every had and I am Blessed and Grateful God chose us to be here! So my friends in a huge nutshell that is what is going. That and the fact that dsl doesn't work. And we have spent two weeks trying to get it fixed. But, I have a plan to 'out fox' the blasted thing. When I go to the office tomorrow I'll just upload my photo's. Slick huh. I suppose I could go check out one those new fangled wifi places too. Maybe I'll try that next week. So until I get this internet thing fixed I'll at least be writing hopefully some uplifting words. I really hope you'll start coming by again. In fact I really need you to because I think some of my review people are going to fire me. So help a girl out and visit and leave comments. They are checking them! Thanks for visiting and remember . . . take heart He has overcome the world! Sorry no photo's on this post. Please enjoy the review and check this book out. As explained on the jacket this is an updated and re-released book . . .
You can open the gift of prayer that God has given you. In this best-selling classic, Dr. Charles Stanley urges you to experience anew your lifeline to God--prayer. You can go even deeper with this life-changing material in your large or small group. Get the most out of your group's study time by using the discussion tools in the Leader's Guide that is now included. Session Goals--know the focus of each session, and learn how prayer is tied to each message. Preparation--specific and helpful tips to organize your group's study time. Discussion--key talking points to help guide your group's discussion. power of prayer between sessions. Praying with authority, Answered prayer, Praying and Fasting, Praying for Others plus many more. It took a little digging on my part but I did find it at Barnes and Noble if your interested in picking up a copy. Handle With Prayer is a definitive guide to the power and practice of prayer. This modern-day classic is a must-read for anyone craving a rich, intimate prayer life that produces results. God longs to communicate with His children. He desires to move in our lives, help us through difficulties, and unveil the unseen. Yet few of us would claim to have a satisfying prayer life. So why is it that so many Christians struggle to open God's precious gift of prayer? This revised and refreshed edition features new artwork, an enhanced study guide, and updated content to connect with today's readers. With over 250,000 copies sold, Handle With Prayer continues to inspire believers of all backgrounds to revive their time of prayer with God. Thanks to B and B media for offering this book for review as part of their blogger review program. Disclosure of Material Connection: I received this book free from B and B Media as part of their book review bloggers program. I was not required to write a positive review. The opinions I have expressed are my own. I am disclosing this in accordance with the Federal Trade Commission’s 16 CFR, Part 255: “Guides Concerning the Use of Endorsements and Testimonials in Advertising. I have to begin this review with an apology for not being able to add a photo. I am borrowing a computer and it won't let me upload. I will add a photo as soon as I can. Enjoy the review. Thousands of real churches-perhaps yours-have been infiltrated by dangerous men. The only escape is the Titus Mandate, the apostle Paul's rescue plan for your church spiritual safety, blessing and unity. If today's Christians are to be rescued from this danger, we have to understand what happened on the ancient Mediterranean island of Crete. There Paul directed his prot'ege Titus to go toe-to-toe with the wolves, carrying out God's very public mission that protects Christians and churches from spiritual dangers. Through the Titus Mandate, you'll be equipped to spot the wolves and protect yourself and those you love from Satan's most prolific form of spiritual danger. I was excited to read this book. I thought it would be interesting and answer some questions I have. For me it was enlightening. It was interesting. But it was also a little hard to read. Mainly because for me it was a little 'deep'. I don't mean that as a negative thing. It isn't a book you can just sit down and leisurely read. It requires focusing and thought. Which is a good thing considering the topic. I can see how it would be a great resource and tool for church leaders. And for lay people that interested in getting deeper and understanding how the Bible says the church should be "run". I found a Q&A supplied by the publicist (click here). And the following is part of the Q&A . . . I included the above because I agree with this thought process. I have experienced and witnessed much confusion, worry and stress over worship. There have been times when I found church ( a particular church) to be a place of dissatisfaction. And, getting the opportunity to read this book to give me some much needed advise and wisdom was a Blessing to me. This book is available at Amazon (click for a direct link). This book was provided for review by B and B media. I was not asked to provide a positive review. But as a caution to I also think we need to be careful not to allow ourselves to be dissatisfied with where we worship. One topic we discuss regularly in our Sunday Services (for info. click here.) is the topic of whether worship is for 'me' or God. Do we worship because we are being selfish and looking for something to please ourselves? Are we looking at worship as another way to grow closer to God? Are we worshipping to check of f a box? Or are we worshipping to Praise God? Prayer for a friend . . .
. . . I need your prayer. I am able only to get inter-net in little smidgens. And it won't upload photo's! So would 'ya pray for me! Leaving you a photo that makes me smile. I don't know why but I just love this photo. Maybe one day I'll add a verse. Good morning...I hope your Monday has started off great. I just have a couple of minutes. It is actually 10:20 on Sunday night. But I wanted to leave you something in case you happened in this morning. Here's a dreamy photo I found. . .
Love this porch. I'm sharing it this morning because I am dreaming of something similar on my new porch. Yes I have a porch! 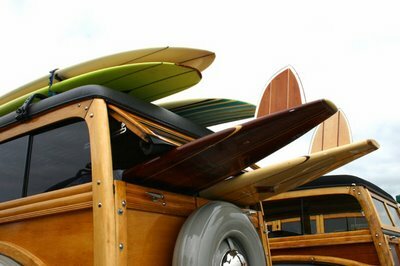 It is so cool. I cannot wait to share it with you. Hopefully I'll get a chance to write a Mission 4 Monday post tomorrow. In case I don't I wanted to let you kow I am thinking about you. All my sweet sisters Alicia, Becky, Denise, Jennifer, Sammie and M.J. to name a few. I miss you all. I am praying that I'll be able to get back to regular posting and visiting soon. Until then enjoy a peaceful, happy and cozy Monday! Wishing you a wonderful Sunday. I was hoping to leave you a couple of great photo's to make you smile. I thought that my inter-net troubles were behind me. But it seems that isn't the case. one week and 2 days. We are still having trouble with the inter-net. It seems to be working but I am not able to upload photo's now. I did manage to get a couple of reviews done. I have a bunch more to get posted. And, I need to tidy up the blog and find some spring photo's to replace all those hearts! I enjoyed putting together those heart photo's. I hope you enjoyed visiting. Thanks dear ones for your prayers. I am praying that things settle down and I can stay on-line long enough to post and that I can get some photo's uploaded. Until next time. I pray you have a Blessed Sunday. Life on the Edge One Woman's Extreme Journey to Find a Life That matters. For this reader the book wasn't quite what I expected. I was expecting a story and bio of the authors (and her families)experiences when they discovered human traffiking alive and at work in a children's home in Portugal. But to my surprise the story was more about how their work in Portugal lead them to discover the modern-day slavery, persecution, disease, and genecide in Africa and the Sudan. Theirs is a story of hard work, lots of faith, struggles, exhaustion, strength, compassion and what it is like to feel God's presence and know his will for your life. For me the story was encouraging. Even though the setting is different than the setting of the ministry that I work with I could understand their struggles. The reader is encouraged and probably led to feel a little guilty when you see how they step out in faith as evidenced by the back cover discription . . . 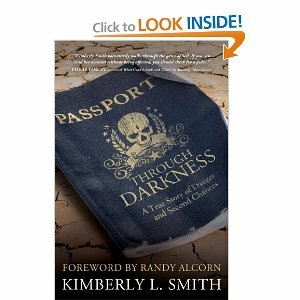 The book is written almost like a diary as Kimberly shares her experiences in building an orphange in The Sudan. But she shares more than just a daily accounting of her experiences she shares her faith. She also shares how God opened her eyes and how she discovered her purpose. Click here to visit the authors website and you can follow the links there to go to the following sites to purchase. . . Parable, Lifeway and your Local Christian Bookstore. For this reader I enjoyed the story. However I have to leave one caution for the reader. The beginning chapters that describe the time the author spent in Portugal are very graphic. These chapters are not written for younger readers. For more info. about the authors work visit the ministry website.